This spring I have been working with quite a few buyers moving to the area from the south. Being as our Spring this year is quite cold, the number one question I hear right now is if our weather is always this way. Let me put your minds at ease and say that this Spring is really odd. The cold has delayed the trees budding, but the grass is getting very green from all the rain. The only thing that really puts a damper in my plans is flower planting and landscaping. Being in zone 4 means that many annuals cannot take colder temps. 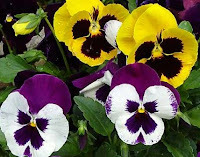 About the only thing you can plant safely outside right now are pansies. So much for Al Gore’s global warming, huh. Ah, but he would say that this was caused by global warming, just like he said the hurricane that his Burma was caused by global warming.